From Freud’s inner circle in Europe through New York and Chicago, analysts moved West to join Bion, Wexler and Greenson in California, opening up new possibilities of clinical practice and technique. The Psychoanalysis of California is studded with Hollywood Dreams and Silicon Valley Fantasy. In this wild wild West, the promise has always been that “hard workers and good people will get everything they want.” But when patients show up still feeling a lack, even though they have done all the “right things,” a tear in the fabric of belief opens wide. How does one practice effectively when surrounded by a culture that promises no lack or loss? 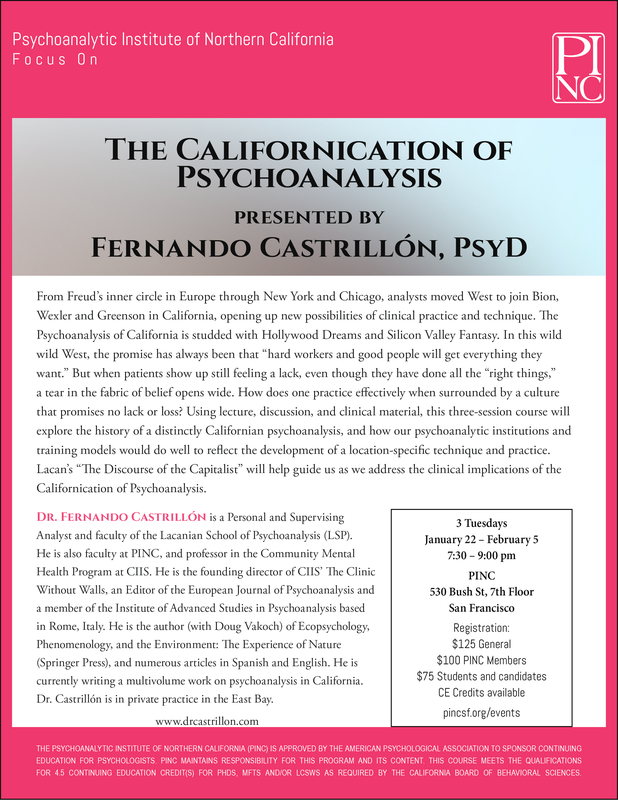 Using lecture, discussion, and clinical material, this three-session course will explore the history of a distinctly Californian psychoanalysis, and how our psychoanalytic institutions and training models would do well to reflect the development of a location-specific technique and practice. Lacan’s “The Discourse of the Capitalist” will help guide us as we address the clinical implications of the Californication of Psychoanalysis.